Desaad is Darkseid's right hand man and helped him gain ascendancy over Apokolips. Desaad is a scientist who creates inventions and devices of destruction for Darkseid and his armies. 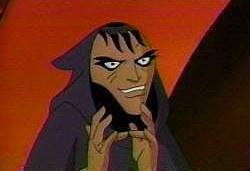 Desaad is an evil, slippery character who will stop at nothing to please his lord and master, Darkseid.